In this guide, you can find information on how to setup SNMP monitoring for Ozeki NG SMS Gateway. The SNMP monitoring feature of Ozeki NG makes it possible for you to query information about your Ozeki NG SMS Gateway installation through the SNMP protocol. For example it makes it possible for you to find out if an SMS Service Provider connection (IP SMS or modem connection) is on-line or not. You can also monitor which users have large message queues. Please note, that this feature is only available in Ozeki NG SMS Gateway 4.2.9 or above. The guide gives you step-by-step instructions on how to setup SNMP support in Ozeki NG SMS Gateway. These steps are useful if you want to integrate Ozeki NG into your corporate network management system. If you work with SNMP you probably use some kind of a network management software. For example you can use Nagios, HP Openview, Novell NMS, IBM NetView or Sun Net Manager. If you don't have a network management software available, you can make simple SNMP requests with an SNMP utility. 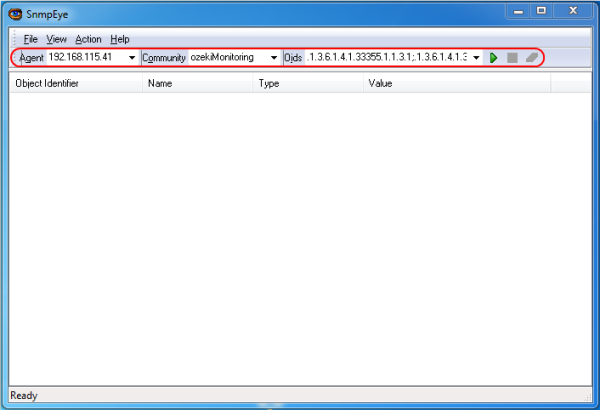 For example most linux distributions provide a command called snmpget and snmpwalk, and for windows, you may download a simple SNMP client, such as the SNMP eye tool. Ozeki NG has a built-in SNMP Monitoring Agent which provides SNMP monitoring service to you clients. When your network management software send an SNMP get request to the Ozeki NG SMS Gateway OID, the request will be forwarded to the Ozeki SNMP Monitoring Agent, that will get the data from Ozeki NG (Figure 1). 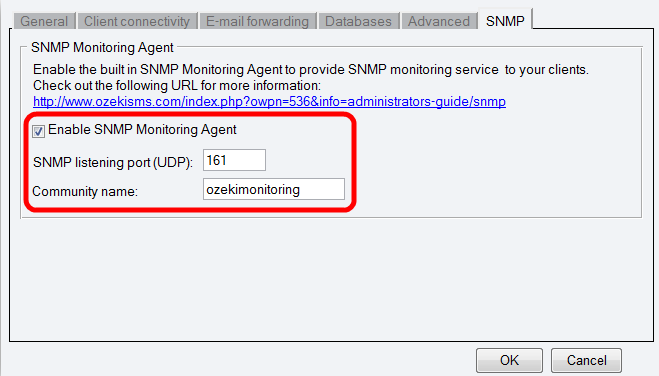 At first, you need to enable the SNMP Monitoring Agent in Ozeki NG in the SNMP tab in the Server Preferences menu (Figure 2) - you need to check the Enable SNMP Monitoring Agent checkbox to start the SNMP Monitoring Agent. 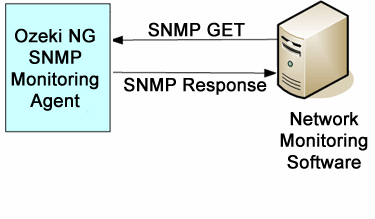 There are two paramteres of the SNMP Monitoring Agent you can configure. The first is the UDP port the SNMP Monitoring Agent will use to listen to SNMP requests - you can set this port number in the SNMP listening port (UDP) field. In the Community name field, you can enter the community name that is used to identify the SNMP community which Ozeki NG belongs to. After you have configured everything properly, you can start sending SNMP GET requests to the Ozeki SNMP Monitoring Agent. 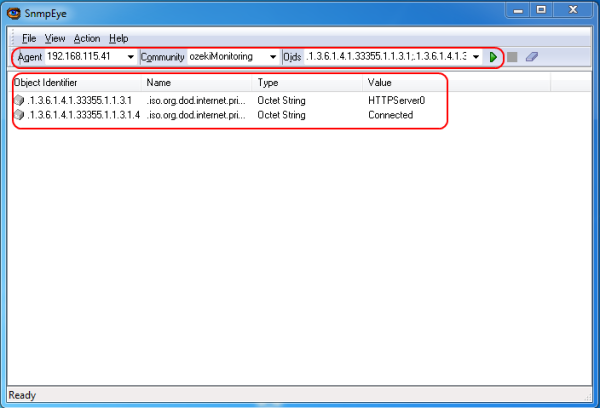 The above mentioned SNMP eye tool is good to try sending some SNMP requests to the Monitoring Agent. You just need to enter the IP Address of the Agent (e.g. the IP Address of the machine running Ozeki NG SMS Gateway), the proper community name (ozekimonitoring in this case), and at least one appropriate OID (Figure 3). Note, that OIDs must start with a dot ("."). The OIDs you can use can be found on the page MIB. After sending the SNMP GET request to the SNMP Monitoring Agent in Ozeki NG SMS Gateway, it sends back the information requested (Figure 4).